The application that you build in this tutorial is a companion administration application for the DVD Store web application. 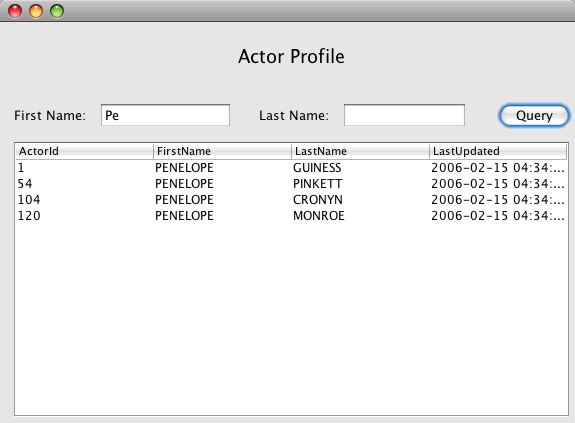 This tutorial covers how to create an application that allows you to query an actor’s profile based on the match with first name or last name. If you wish you can extend the application to query film details and to add/update/delete items. This tutorial uses MySQL and the Sakila database, but you can use any supported database server with Hibernate applications. The Sakila database is a sample database that you can download from the MySQL site. Information for setting up the Sakila DB is provided in the following sections. When you click Connect a database connection node for the Sakila database ( jdbc:mysql://localhost:3306/sakila [username on Default] ) is listed under the Databases node. When a connection is open you can view the data in the database by expanding the connection node. Deselect the Use Dedicated Folder option, if selected. For this tutorial there is little reason to copy project libraries to a dedicated folder because you will not need to share libraries with other users. The Hibernate configuration file ( hibernate.cfg.xml ) contains information about the database connection, resource mappings, and other connection properties. When you create a Hibernate configuration file using a wizard you specify the database connection by choosing from a list of database connection registered with the IDE. When generating the configuration file the IDE automatically adds the connection details and dialect information based on the selected database connection. 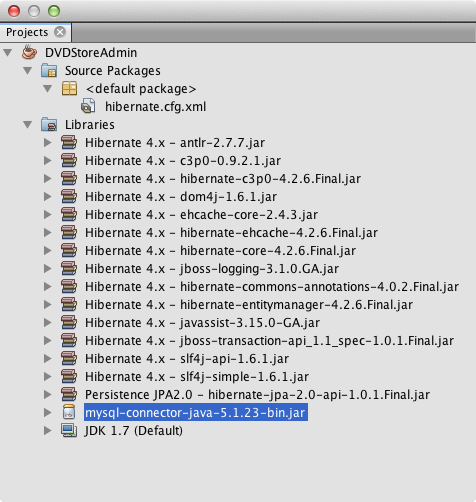 The IDE also automatically adds the Hibernate library to the project classpath. 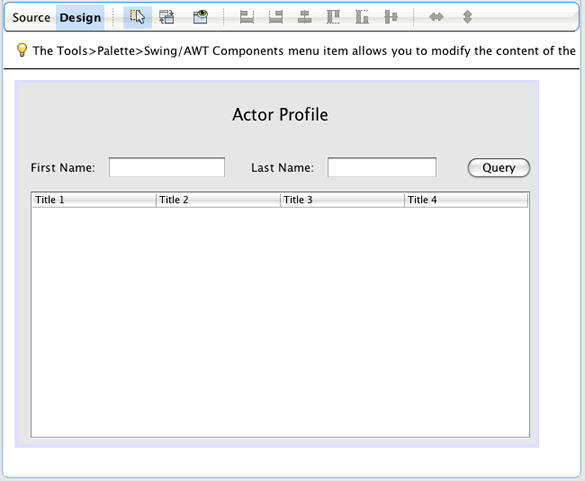 After you create the configuration file you can edit the file using the multi-view editor, or edit the XML directly in the XML editor. 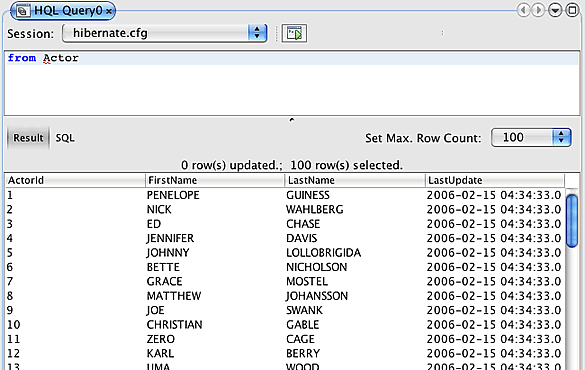 After you create the form and set it as the main class you will be able to see the SQL query printed in the IDE’s Output window when you run the project. The reverse engineering file ( hibernate.reveng.xml ) is an XML file that can be used to modify the default settings used when generating Hibernate files from the metadata of the database specified in hibernate.cfg.xml . The wizard generates the file with basic default settings. You can modify the file to explicitly specify the database schema that is used, to filter out tables that should not be used and to specify how JDBC types are mapped to Hibernate types. Keep the default * src * as the Location. Click Next. When you click Finish, the IDE generates the POJO Actor.java with all the required fields and generates a Hibernate mapping file and adds the mapping entry to hibernate.cfg.xml . Right-click in the editor and choose Fix Imports (Ctrl-Shift-I; ⌘-Shift-I on Mac) to generate import statements for the Hibernate libraries ( org.hibernate.Query , org.hibernate.Session ) and java.util.List . Save your changes. Right-click in the editor and choose Fix Imports (Ctrl-Shift-I; ⌘-Shift-I on Mac) to generate an import statement for java.util.Vector and java.util.List . Save your changes. Now that the coding is finished, you can launch the application. Before you run the project, you need to specify the application’s Main Class in the project’s properties dialog box. If no Main Class is specified, you are prompted to set it the first time that you run the application.